Mercury is the only metal which under normal conditions represents a liquid. It is used in the measuring devices, vacuum pumps. Compounds of mercury are used as substances, detonators, as well as in health and agriculture. All known fluorescent lamps is also lit by pairs of mercury. This substance is still used in hydrodynamic bearings are subjected to particularly heavy loads. How do you find them in the air? There is a simple and visual way, based on the qualitative reaction of mercury with iodide of copper. The formed substance with the formula Cu2(HgI4) has a pink-red color. The higher the concentration of mercuryis, consequently, more intense coloring it. To produce the indicator, you will need a porous filter paper, any soluble salt of copper, for example, chloride, sulfate, a salt solution of potassium iodide or sodium iodide, and a solution of sulphite or hyposulphite of sodium. Paper cut into strips (size is unimportant, but smaller is better), dipped in solution of salt of copper, after which it is removed, slightly dried, and dipped in solution of salt of iodine. The copper iodide formed will be mainly in the pores of the filter paper and iodine on the surface for his paper "boburiy". Then the strips are placed in a solution of sulfite (hyposulphite) of sodium. Iodine is removed (this is evident by the discoloration of the paper). The strips should be washed in clean water, dry. They're ready. It is advisable to store them in a dark place, in closed containers. If there is a suspicion that in the air there are pairs of mercury, it is necessary to put one strip in each check area. After a few hours, check for any changes. If it was pinkish-red is alarm. So, there is in the air mercury! It is necessary to take measures for detection and removal of the source of this poison. Mercury vapor is extremely poisonous, causing severe illness of a number of organs of the human body. Many residents and guests of St. Petersburg, St. Isaac's Cathedral admiring without even suspect that a few dozen people involved in the gilding of the dome, has died or become disabled, because in this work the method was used amalgam (with mercury). 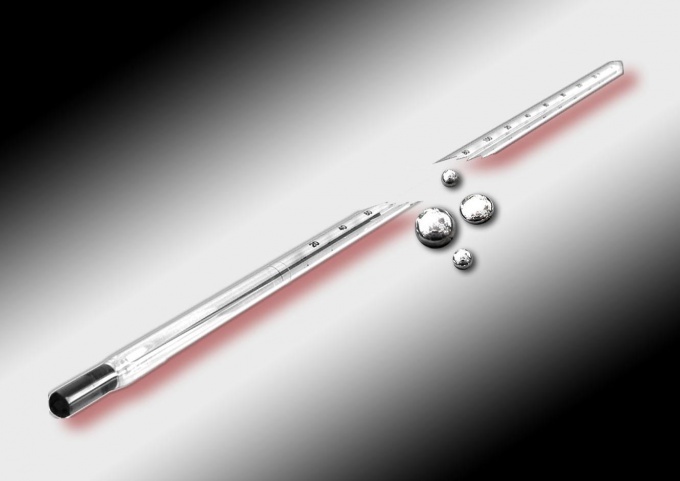 Even a single mercury thermometer broken in the apartment, can cause trouble. The more that mercury vapors are odorless and until then you can't see remind.